Our lovingly renovated hotel in the historic Schmalkalder old town with individually furnished rooms is an ideal starting point for your city break, your hike or your business trip. Start the morning with a good breakfast from our rich buffet, enjoy the view directly to Castle Wilhelmsburg or over the historic old town and end your day in our romantic courtyard, in the historic Landgrafengewölbe or in our very cozy restaurant "Hopfengarten". Chargraf Wilhelm IV of Hesse had built around 1580 the house Weidebrunner Gasse 12 as a landmark Hessian possession in the dual rule Schmalkaldens (the other half belonged to the Counts of Henneberg) in the central axis of the former cattle and Roßmarktes (now Neumarkt). 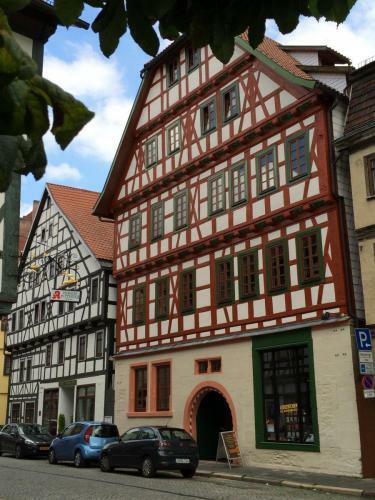 About Romanesque foundations, the ground floor was built in stone construction, about it was built in the Renaissance, an imperious Franconian half-timbered building in 3 storeys. In the cellar vault is the historic wine cellar of the landgrave. On the ground floor were elevated above the wine cellar, the reception rooms (now Knights' Hall) and the bath room of the Landgrave (today Landgrafengewölbe), on the ground floor the farm pigeon. The wall to the rooms of the Landgrave was adorned with paintings and banners (today, for the time being, restored) - including the Trabanten, one with a musket, as we find it from the same hand in the later painted Schloss Wilhelmsburg. In the egenakugeb dining room on the second floor of the Landgrave himself took residence and gave in 1586 receptions for aristocratic goats and councilors. After taking over the rule by Hessen accounted for the sovereign function of the house. It was sold in the 17th century and then expanded in baroque style with a backbone. The resulting courtyard with the encircling arcades after the elaborate and loving restoration of the entire estate since 1993 by the Dipl. Restorer Manfre dund Rolf Möller a charming backdrop and a romantic entrée for the hotel and guest house "Green Gate". Since 2004 the Ensemeble belongs to a community of owners, who gradually renovated the object. Thus, in 2009 on the left side (Weidebrunner Gasse 14) a dormitory was added for about 25 hours, in 2011 the hotel was re-opened.